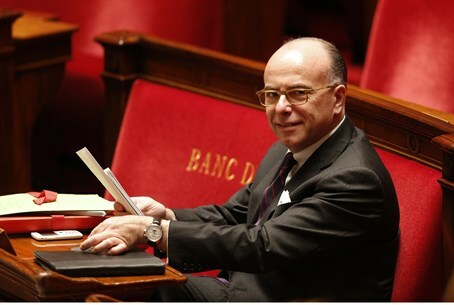 Despite rising anti-Semitism in Europe, and France in particular, Jews still have some friends, especially French Interior Minister Bernard Cazeneuve who announced his love for French Jewry. Cazeneuve's remarks were made Wednesday during a speech at a gala in the Paris Marriott Hotel organized by the French Jewish Radio J station. “I feel more close to you than you can imagine. Also in my heart, through ties of affection and friendship and sentiment, but also — and this is almost more important to me — through spirit. Through a great admiration,” Cazeneuve stated. Cazeneuve, 51, is a Socialist politician who replaced Manuel Valls as Interior Minister in April, after Valls became prime minister. While not Jewish, Valls has been married to Jewish violinist Anna Gravoin since 2011. The marriage connected him "in an eternal way" to Israel and the Jewish people, he stated. He added that "anti-Zionism is an invitation to anti-Semitism." He also shared recollections of attending lectures on Judaism at the synagogue on Rue Copernic in Paris. Four people were killed in a terrorist attack at that same synagogue in 1980. Indignation in the face of anti-Semitic attacks is “another issue that connects me to you,” Cazeneuve stressed, addressing the rise in anti-Semitic hate crimes in France since 2002. “Every time you feel the violence exercised against you, when you are afraid for your children, when you are worried about this rising violence, remind yourselves that the republic protects you and an interior minister who loves you and who is your friend,” Cazeneuve said.